The global endoscopic ultrasound needles market was valued at around US$ 139.2 Mn in 2016 is anticipated to expand at a stable CAGR of over 4.5% during forecast period of 2017 to 2025, according to a new report published by Transparency Market Research (TMR) titled ’Endoscopic Ultrasound Needles Market – Global Industry Analysis, Size, Share, Growth, Trends, and Forecast, 2017–2025.’ Expansion of the global endoscopic ultrasound needles market is expected to be driven by technological advancements and increasing use of single-use endoscopic ultrasound needles during the forecast period. 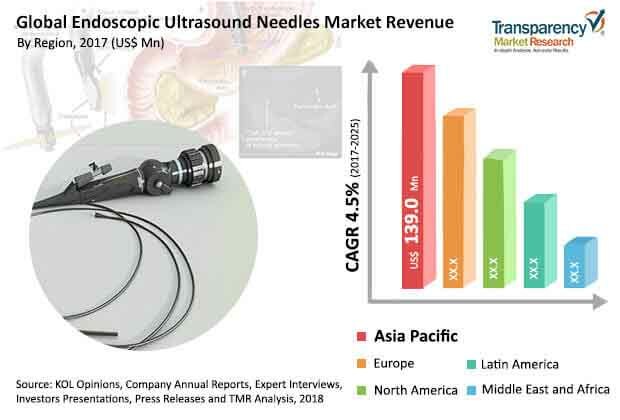 The endoscopic ultrasound needles market in Asia Pacific is likely to expand at a CAGR of above 5.0% due to high prevalence of diseases, development in the health care sector, and increased focus on research and developmental activities. The global population is aging rapidly, especially in some developed economies such as the U.S., most of Western Europe, and Japan. Developed economies witness high rates of aging as compared to developing economic countries. This is attributed to improved health care infrastructure, reimbursement policies, and advancement in health care facilities in these countries. Moreover, easy access to various diagnostic and treatment services has improved in the recent past, especially in developed economies. This, in turn, has increased the life expectancy of the population. The geriatric population is the major end-user of bariatric surgeries, knee-hip implants, colonoscopy, and gastrointestinal endoscopic ultrasound procedures for the improvement in the quality of their life. Increase in number of elderly people leads to high rate of ailments, which, in turn, is likely to propel demand and consumption of endoscopic ultrasound needles. Cancer is the second leading cause of death, and in 2015, it was responsible for 8.8 million deaths worldwide. Helicobacter pylori infection is the best known carcinogen for gastric cancer. Most of the gastric cancer cases in the Western countries are diagnosed at late stages when the treatment remains less effective. Increasing prevalence of chronic diseases such as cancer associated with pancreas and stomach have increased the demand for diagnostic methods to detect cancer at early stages. The progress of gastrointestinal tract related cancers depends upon their stage, and most advanced developments in diagnostic ultrasound endoscopy have therefore focused on early detection. These factors are expected to increase demand for endoscopy ultrasound needles in the future to identify cancers at an early stage. In terms of gepgraphy, the global endoscopic ultrasound needles market can be divided into North America, Europe, Asia Pacific, Latin America, and Middle East & Africa. North America is estimated to constitute a leading share of the global market during the forecast period, owing to high adoption of EUS needles and high health care expenditure in the region. Europe is anticipated to account for a significant share of the global market between 2017 and 2025. Increase in the incidence of cancer and chronic hepatobiliary diseases in Europe is projected to fuel the market in the region during the forecast period. The market in Asia Pacific is projected to expand at a rapid pace during the forecast period, due to increasing health care expenditure in the region. The endoscopic ultrasound needles market in Latin America is at a pivotal point today. It was valued around US$ 22.0 Mn in 2016 and anticipated to expand at a significant pace. Increasing focus of key players on expansion in Asia Pacific with its large untapped population and rising awareness about health care are expected to propel the endoscopic ultrasound needles market in Asia Pacific.